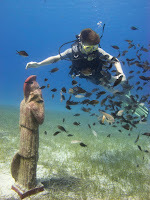 Scuba Tech Diving Centre is based in Protaras, on the east coast of Cyprus. The Diving team love scuba and we offer it all from absolute beginner trying to dive for the very first time to diver training courses from PADI, BSAC and TDI for all kind of diving. So whether you have single tank, twinset, rebreather or sidemount diving, Scuba Tech is the place in Cyprus to come. Our inhouse technicians can also look after all your diving equipment to keep it ship shape and dive fit. We all had to start somewhere with our Scuba Diving adventures and for many people, the biggest difficulty is knowing where to begin. How can you Try Scuba Diving for the very first time? The first step when scuba diving is to make sure you are fit and healthy. Now, this doesn't mean that you have to be able to run marathons but there are certain health conditions that would require you to see a doctor before you can take part in scuba diving. You can access a copy of the Medical Questionnaire for diving here. Secondly, you need to find a reputable Diving Instructor or Dive Centre that will take you and do the experience properly. You can find them through friend recommendations and online reviews. At Scuba Tech, we are all qualified PADI diving instructors and we do not operate in big groups, so your diving experience will be a maximum of 2 students to each instructor in the water. This guarantees you will have the full attention of the instructor at all times throughout the dive and you can feel safe in the knowledge that your safety and enjoyment is paramount. What does the Try Dive involve? The Discover Scuba Dive is a three part experience where someone with absolutely no prior experience or qualifications can see the underwater world first hand. Part one will teach you the basic concepts of scuba diving; how our bodies deal with going underwater and how to look after ourselves down there. We also discuss the equipment that we will use and the various controls and also how to communicate with the instructor, since you will not be able to talk down there. This is just a short briefing but is highly important to make sure you enjoy yourselves. Part two comes after you have been kitted out with the properly fitted diving equipment and we head down to the local dive site, Green Bay. During Part 2, you will be in a confined water area of the Bay with swimming pool like conditions. Here you get used to breathing underwater and the feeling of weightlessness that you have when scuba diving. You will also practice a number of diving skills that you may or may not need during your dive such as; taking out and replacing the regulator (what you breathe from) and clearing water out of the mask. Part three is the actual diving part when you move into Open Water and get to really see what scuba diving is all about. Your instructor will take you out to Fish Rock to see all the fish that gather in this area. The SeaBream, Damsel Fish and Wrasse will gather around to look at this strange bubble blowing creature in their midst and you will be amazed at the array of colours surrounding you. 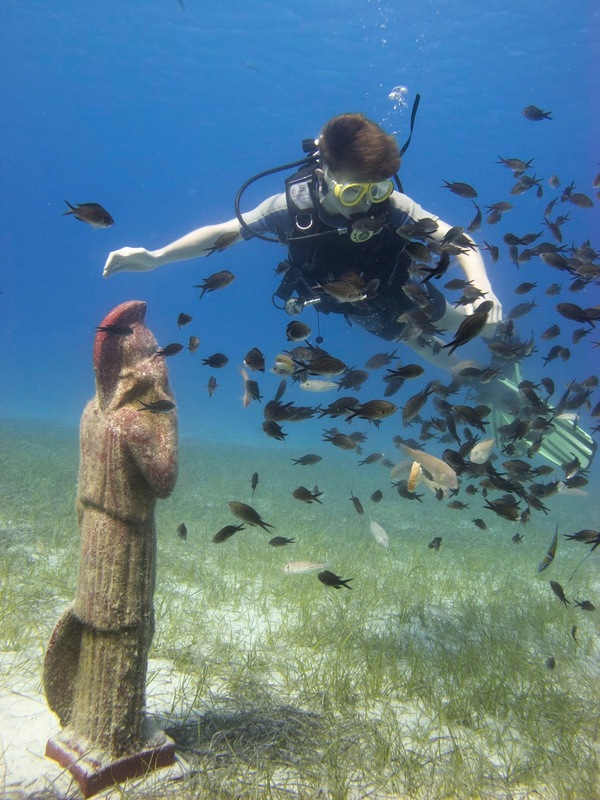 If you are comfortable, your instructor may then take you deeper to a maximum of 9 metres, where you will find our very own "Atlantis Statues". These are great for playing and posing on and if you have opted to have our Divemaster come with you to take photos, these provide an amazing photo opportunity. The depth increase is very gradual and there is always a bottom underneath you, so you only go as deep as you are comfortable going. Your instructor will be there at every step of the way to hold your hand (literally, if needed) and make sure your experience is amazing. I feel I should warn you though, bubble blowing is addictive and once you start, it is difficult to stop. Saying that, Scuba Diving is a hobby that you can enjoy for a whole lifetime with so many places to see and so many different branches available. You can dive wrecks or reefs. You may enjoy Underwater Photography or making Underwater Movies. Diving has something to offer everyone but the first step is to give it a try. Now you know the steps, it is as easy as 1,2,3. In my first season at Scuba Tech as a Divemaster trainee, I watched my instructor, complete his Tech 1 course with GUE. For those of you that haven’t heard of GUE, it is a diving organisation, and it stands for Global Underwater Explorers. GUE trains its divers to the highest standards in proficiency underwater, and allows divers to be the best they possibly can be under expert instruction. This is what I saw two years ago, when Rich Walker (Technical Director of GUE and instructor) came to Cyprus. Watching the Tech 1 candidates complete skills and drills whilst completely motionless in the water was something I aspired to be able to do. To have that level of control and skill would be awesome. So naturally the first step for me is GUE fundamentals otherwise known as fundies, which provides the foundation for all other courses such as the caving or technical programmes within GUE. I want to become the best possible diver I can be, in order to be the best instructor I can be. Working as a Divemaster already, this is perhaps my biggest reason for signing up for fundies. I can then apply what I learn to the everyday, when I am in the water with customers. Furthermore it also is a new challenge for me. I never want to stop learning and I want to keep trying new experiences. This will then (hopefully) maximise my competence and confidence underwater. The course itself, is spread over four days, and has a mixture of classroom and in water practice. It focuses on the fundamental skills of diving including trim and buoyancy, rescue skills, gas management, equipment configuration, decompression theory and nitrox. Unlike some other courses, GUE fundamentals has various outcomes – Fail, provisional pass, recreational pass, or a technical pass - the highest pass rating. The course is programmed to help those advance their basic skills, and to provide divers that have trained with other organisations such as PADI, TDI and BSAC with a gateway into GUE training. It is aimed at all levels of diver, for example, I have been diving for 7 years this year, I am a Divemaster and also a tech diver, yet I could be on the course with someone who has just started diving. It is designed to “cultivate the essentials skills required by all irrespective of level or environment” It looks at your dive skills and improves them to a much higher level whilst also having lots of fun! The Cobra Dive Boat is now coded for evening trips, which means that, for 2017, Scuba Tech Diving Centre are pleased to be able to offer Night Dives on the wrecks. Below is a video from the first ever night dive done on the wreck with Scuba Tech Diving Cyprus, Mark Robinson and Allister Fraser. The Footage above was very kindly donated to us by Mark from his GoPro mounted atop a stills camera. If you would like to book your night diving on the wrecks in Protaras, please do not hesitate to get back in touch with us here at Scuba Tech Diving Cyprus and live the adventure!! scuba tech cyprus. Awesome Inc. theme. Theme images by RBFried. Powered by Blogger.